Jadyn in a Premier Youth Basketball League game with the Lady Washington Bulldogs. Twelve-year-old Jadyn T. Donovan, granddaughter of St. Kitts and Nevis national, Sylvester M. James, is burning up the basketball courts on the US Atlantic seaboard and becoming an up-and-coming player to watch. Jadyn, the daughter of Beverly James-Donovan and Thomas Donovan, lives in Upper Marlboro, Maryland, She has one sister, 10-year-old Cameron, and a brother, 4-year-old James. When Jadyn was six-years-old she developed an interest for the game. During school recess when the other girls would play on the swings and slide, Jadyn made her way to the basketball court. Jadyn began playing in Maryland at her local church, the DuPont Park Seventh Day Adventist Church, which participates in a Metropolitan League organized by the Federation of Adventist Churches in the Allegany East Conference. Jadyn’s first coach Diallo Watts, peaked her interest in basketball, teaching her the basics of the game while Jadyn was in the fourth- through sixth-grades at the DuPont Park Adventist School. That same year, Jadyn became more interested in basketball. Her mother and father enrolled her in a two-week Nike All-American Basketball Camp in Bowie, Maryland. The Camp was hosted my Sonia Chase a former WNBA player and facilitated by Lawrence Morton a former Syracuse Basketball star and NBA player. Nike Basketball Camps teach athletes from newcomers to varsity- level players. They are designed to help young basketball players develop their skills. Participants train with top-level instructors, including NCAA coaches, current and former professional players and highly recognized local coaches. What 11-year-old, who is an avid basketball player, turns down an offer to go to a Nike Basketball camp, and especially one coached by Lawrence Morton, a well-known professional basketball star. Jadyn was motivated and Coach Morton taught her a lot. His goals are to help players develop athletically, refine their fundamental basketball skills and enhance their skill set at the post, wing or guard position. Jadyn learned signature drills, basketball skills, techniques and tips. She said the camp was fun and encouraging. Coach Morton saw a promising basketball future for Jadyn and recommended she sign up to play at the Riverdale Baptist School in Upper Marlboro, Maryland. At that school, The Lady Cruisaders basketball team is well-known, with a nationally- ranked basketball program. On the first day of camp, Coach Morton told Jadyn’s parents that she could go as far as she wanted to in basketball. He was the first, but would not be the only coach who would tell her that. At Coach Morton’s recommendation, in the seventh-grade, Jadyn joined the Riverdale Baptist School Lady Cruisaders. Initially she played on the school’s volleyball team while she waited for the basketball season to begin. Jadyn was named “Most Outstanding Player,” in the team’s championship game. She is now in her second season with the Lady Crusaders Volleyball program and has been invited to join the High School Team. Basketball camps are taking more notice of applicant’s academic accomplishments. Proposition 48 requires college freshmen to meet minimum academic standards or they will not be able to participate in their chosen college sport for one year. Therefore, camps emphasize up-and-coming youth who hope to obtain a college scholarship need to have high scores on key tests, the American College Test (ACT) and Scholastic Aptitude Test (SAT). Jadyn is a solid A student with a 4.10 GPA on a 4.0 GPA scale. She is in the eight-grade accelerated-academic program where she averages an A in each of her subjects. Jadyn was also invited to join Lady Prime, an AAU basketball travel team. “Team Prime/Marissa Coleman” is a youth basketball Organization (started by former Georgetown University and NBA player, Lonnie Harrell). The team’s goal is to help young men and women live out their dreams of developing into collegiate student athletes. LPMC gives student athletes a chance to play national basketball while supporting community organizations by volunteering their services. They support causes, fund-raisers and at the same time help team members improve their basketball skills, socialize with their coaches and teammates and become better men and women. This past summer Jadyn was recognized as the “Queen” of the Summer (MVP) for the Premier Youth Basketball League, this is a Middle School Basketball League for the top players in the States of Maryland, Virginia and the District of Columbia. She led the league in points scored, field goal percentage, field goals made, rebounds, block shots and was third in steals. While becoming a key player with the Lady Cruisaders, Jadyn became recognized as one of the top Middle School Basketball players in the country. This past April, she was selected to play in the Elite Girls Basketball All American Middle School games held each year during the women’s NCAA Basketball Championship. Jadyn is well-known on the girls’ basketball circuit by her competitors because she has develop a reputation as a two-way player. She plays extremely well on both sides of the basketball court. Jadyn has been singled-out by many of the leading national High School and Collegiate talent evaluators as an up-and-coming player and someone to watch. She is recognized as one of the top middle school basketball players in the US. From her accomplishments, it is hard to realize Jadyn isn’t a high school senior. 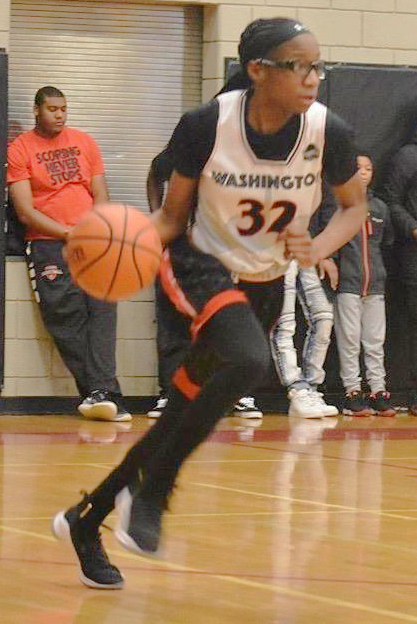 She has already received Letters of Interest from several Division 1 basketball programs, including the University of Maryland, Virginia Tech University and North Carolina A&T University. It will be interesting to see what the future brings for Jadyn—if it in any way resembles the past, it should be bright!